Engine Timing Belt Kit with Water Pump-Water Pump Kit w/Seals fits 99-05 Jetta. Country of Origin (Primary) : CN. Harmonized Tariff Code (Schedule B) : 8413309000. Life Cycle Status Code : 2. Product Description - Long - 80 : WATER PUMP KIT WITH SEALS, DAYCO. Also review the notes section in the compatibility chart for additional specifications about this part. This part generally fits Volkswagen vehicles and includes models such as Beetle, Golf, Golf City, Jetta, Jetta City with the trims of Base Hatchback 2-Door, Base Hatchback 4-Door, Base Sedan 4-Door, Cabrio Convertible 2-Door, Comfortline Hatchback 4-Door, Comfortline Sedan 4-Door, Confort Hatchback 2-Door, Confort Hatchback 4-Door, Confortline Sedan 4-Door, Edicion Limitada Sedan 4-Door, Europa 50 Aniversario Sedan 4-Door, Europa Hatchback 4-Door, Europa Sedan 4-Door, Europa Wolfsburg Sedan 4-Door, GL Confort Sedan 4-Door, GL Convertible 2-Door, GL Hatchback 2-Door, GL Hatchback 4-Door, GL Sedan 4-Door, GL Variant Wagon 4-Door, GL Wagon 4-Door, GLS Convertible 2-Door, GLS Edicion especial Hatchback 2-Door, GLS Hatchback 2-Door, GLS Hatchback 4-Door, GLS Sedan 4-Door, GLS Sport Hatchback 2-Door, GLS Variant Wagon 4-Door, GLS Wagon 4-Door, GLS Wolfsburg Sedan 4-Door, GTI GLS Hatchback 2-Door, GTI Hatchback 2-Door, Highline Sedan 4-Door, Jazz Sedan 4-Door, Limited Edition Sedan 4-Door, Lujo Hatchback 2-Door, Lujo Hatchback 4-Door, Special Edition Sedan 4-Door, Sport Hatchback 2-Door, Summer Edition Sedan 4-Door, Trendline Hatchback 4-Door, Trendline Sedan 4-Door, Trendline Wolfsburg Sedan 4-Door, Variant Comfortline Wagon 4-Door, Variant Trendline Wagon 4-Door, Verano Hatchback 2-Door, Verano Hatchback 4-Door. The engine types may include 2.0L 1984CC 121Cu. L4 GAS DOHC Naturally Aspirated, 2.0L 1984CC 121Cu. L4 GAS SOHC Naturally Aspirated. This part fits vehicles made in the following years 1998, 1999, 2000, 2001, 2002, 2003, 2004, 2005, 2006, 2007, 2008, 2009, 2010. We at PartsMonkey are proud Canadians and are proud to serve our fellow Canadians. We offer a full range of automotive products from chassis components to auto body parts and everything in between. We carry the premium brands of the automotive aftermarket industry including Federal Mogal, Spectra Premium, Standard, Monroe, Bosch and Magnaflow. We also offer a wide arrangement of value brands at exceptional value. PartsMonkey is committed to the environment as well. Our goal is to provide you with any and all automotive products that may be required. Our exceptional relationship with our suppliers allows us to source any parts you may require within a small time window. Given our easy and convenient quote option, we make it possible to locate those hard to find products. We hope you enjoy your experience with us and thank you for shopping at PartsMonkey. Once the product is received, it will be inspected to ensure the original packaging has not been damaged, no parts or hardware are missing, all installation instructions are present, the part is not damaged or disassembled, and no evidence is present of the product being installed and removed, then a credit will be issued. , Special order products, Promotional or discontinued products. Please note that we will not cover any labour claims against defective products. If the product is defective then we will do our best effort to have a replacement part sent out in a timely manner or issue a credit for the product. Portions of the part information on this page have been provided by WHI Solutions, Inc. 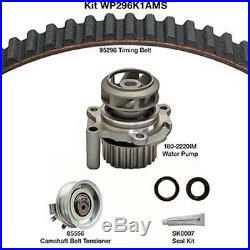 The item "Engine Timing Belt Kit with Water Pump-Water Pump Kit withSeals fits 99-05 Jetta" is in sale since Monday, March 27, 2017. This item is in the category "Automotive\Parts & Accessories\Car & Truck Parts\Engines & Components\Timing Components". The seller is "partsmonkeyca" and is located in London, Ontario. This item can be shipped to Canada.